I enjoy the Tragically Hip. I am saddened by the news of Gord Downie’s cancer, just like the rest of the country. Of course the Man Machine Poem tour would end with the Tragically Hip in Kingston, but I am so over all the hoopla that is going on around their last tour stop here in the Limestone City. Being a Kingstonian, working in downtown Kingston, and trying to be a local influence with my blog means I should be all over this concert, and the simulcast in the square. Truthfully I’m not. I’d love to be in the Rogers K-Rock Center enjoying it with 6000 of the biggest Hip fans, but I’m not too sad that I’m not able. Frankly I don’t know anyone who got tickets to see this wildly hyped up concert in the venue. As a blogger, wannabe photographer, and a music lover I would like nothing more than to go downtown on Saturday, and brave the giant crowds and grids of closed-to-traffic streets. As a parent, the wife of a man who has to work late this weekend, and a person interested in saving their sanity (not to mention get up early on Sunday to have some family fun! ), I won’t go. I can watch (by that I mean record) the concert on tv, have my glass of wine at home, and go to bed when I’m ready. The CBC is broadcasting the concert from the KRock Centre live on tv and on the CBC radio channels. More information on these broadcasts can be found here. But for those of you who are ready to brave the wildness of downtown on Saturday I thought I would share with you what I know about the happenings this weekend. Road Closures – Check out the pictogram from the City of Kingston. From the hearsay it sounds like you won’t be able to drive anywhere remotely close to Market Square. Kingston Transit is free all day – they have increased the express routes and will be running buses until 2:30am. If you click the link to the City’s Webpage above, all the transit details are there as well. There is also a Park and Ride operating from St. Lawrence College. Again, the details are on the link above. We know many of you are music fans and that you may not have been able to buy tickets to this Saturday’s The Tragically Hip concert. 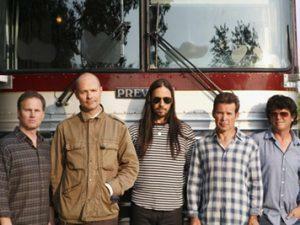 You can still join in and here are the details The Tragically Hip Day in Kingston. The Tragically Hip will perform at the Rogers K-Rock Centre on August 20, 2016 beginning at 8:30 p.m. CBC will livestream the concert across Canada and the City of Kingston – with partners, Kingston Accommodation Partners and the Great Waterway – are excited to be hosting the livestream at Springer Market Square. The Kingston Public Market will close at 2 p.m. so set-up for the live-stream can get underway. You can experience the CBC livestream from anywhere. Click here for details. 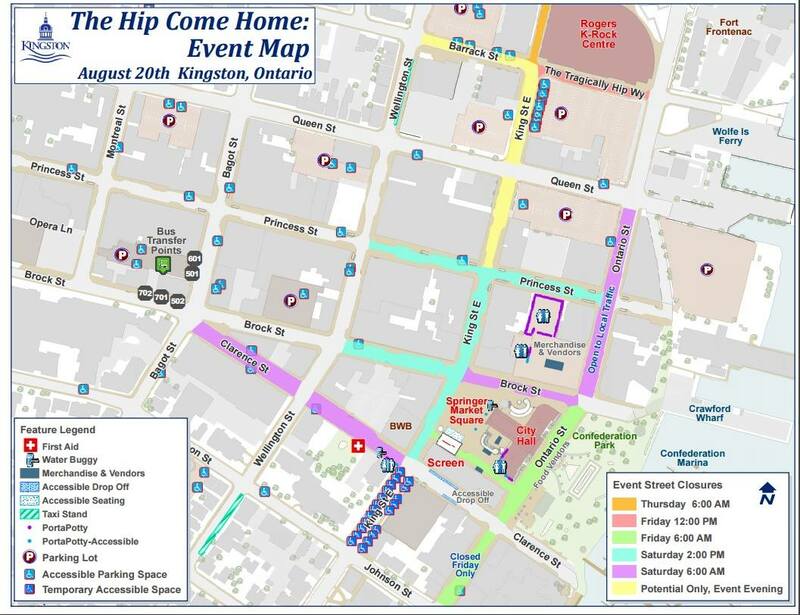 Please visit CityofKingston.ca/HipInKingston for a detailed map of all planned road closures and transportation options, as well as some guidelines to help you enjoy your day. Now for any of you extra-lucky people who managed to grab tickets to this fabulous event, the K-Rock Centre has put out an advisory with information on parking, times the gates open and the show starts, and other event information. Follow this link to read it for yourself. While browsing all things Tragically Hip in Kingston I found this post. It’s a flyer being distributed to everyone who will be inside the KRock center, and also to everyone and anyone else watching the show, both locally and across the country. Apparently everyone is going to sing Courage between the last set and the encore. The flyer and the Facebook post have all the words and a bit of senitmentality for us to share with the Hip and the rest of the country. It’s quite sweet. And just in case there wasn’t enough hype over this whole concert/simulcast business, our wonderful prime minister – Justin Trudeau – will also be attending the K-Rock Centre performance Saturday night. I’m not too sure why he’s not at the Ottawa concert tonight (or maybe he is!) but I’d love to catch of glimpse of him in downtown Kingston this weekend! So that’s all I know about this event. I’m sure browsing the net for the next few days, other tidbits and interesting items will be revealed, but for tonight this is all she wrote. You can follow other conversations about the Tragically Hip in Kingston on Twitter with the hashtag #HipInKingston. I’ve seen the mayor posting some stuff today – I’m sure there will only be more as Saturday approaches. Be safe, have fun, and you may see me and my girls downtown during the day on Saturday, checking out the pre-show craziness. If I get photos of anything great I’ll be sure to share them. If you are going, or know of any other important details that should be shared, please comment below. It’s going to be a wild night, but I’m sure it’ll be a night to remember. Working mom, pushing 40, writer, wine drinker, and married mom of two tween daughters. I'm sharing my motherhood journey through words, experiences and photos. Join me as a write my way through the joys and challenges of motherhood as a working mom.